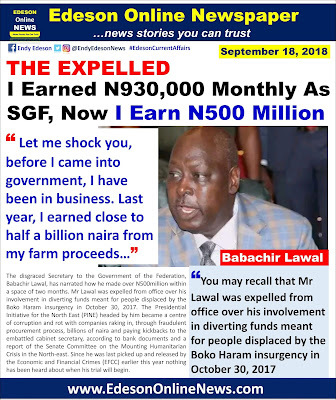 The disgraced Secretary to the Government of the Federation, Babachir Lawal, has narrated how he made over N500million within a space of two months. Mr Lawal was expelled from office over his involvement in diverting funds meant for people displaced by the Boko Haram insurgency in October 30, 2017. The Presidential Initiative for the North East (PINE) headed by him became a centre of corruption and rot with companies raking in, through fraudulent procurement process, billions of naira and paying kickbacks to the embattled cabinet secretary, according to bank documents and a report of the Senate Committee on the Mounting Humanitarian Crisis in the North-east. 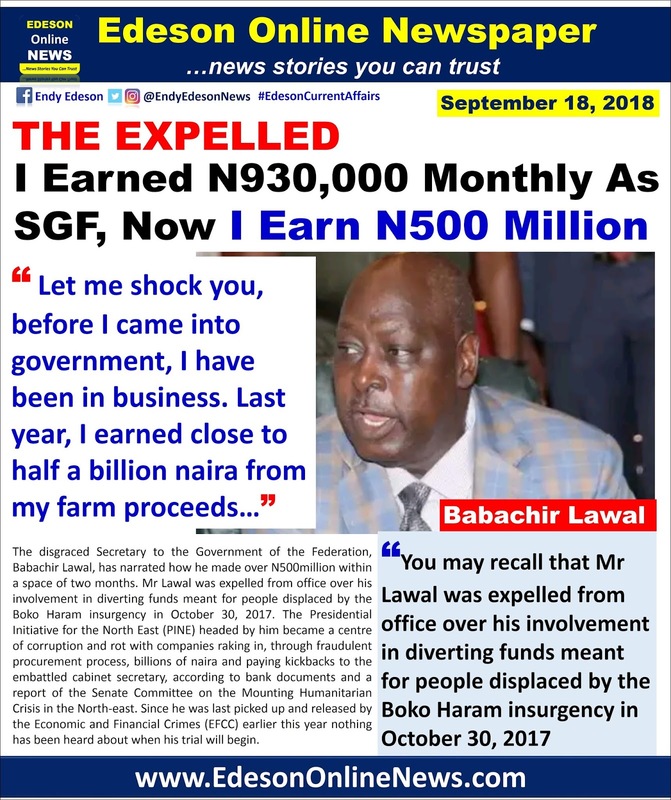 Addressing newsmen on Monday, Lawal having been earning N930, 000 monthly while in government narrated how he made over half a billion Naira in two months after leaving office. He said his removal from office later became a blessing in disguise. “Let me shock you, before I came into government, I have been in business, I was a very successful businessman,” the news agency of Nigeria (NAN) quotes him as saying. “Last year, I earned close to half a billion naira from my farm proceeds, I have a cattle ranch that I am developing gradually and I am back to IT consultancy, life is now good,” he added. Lawal also reeled out reasons why Nigerians should re-elect his former principal, President Muhammadu Buhari. The face of a looter and liar. If he were a successful bizman as he claims, why accepting a job paid less than a million Naira? Can we imagine Dangote, Adenuga, Otedola, Dantata, etc leaving their buz and taking such appointments? The problem with some idiots like him is that they always fail to realise that most Nigerians are now more educated than them. How can someone steal 240 million and turn around to tell us you were a successful bizman? #930k for that position then state governors, commissioners, heads of government agencies, local government chairmen, ministers, deputies, IGP, senators, government communicators, government secretaries, presidential staffers at the office of the president, politicians with or without portfolios, etc may end up earning undocumented salaries worth more than #3m a month.